Home / AwardsGrants&Scholarships / Excellence in Teaching Award for 2017: Congratulations to Sara Cain! 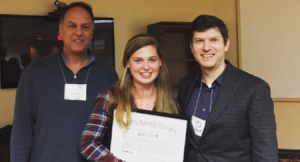 The Classical Association of Massachusetts congratulates Sara Cain on receiving our Excellence in Teaching Award for 2017. Sara’s commitment to Latin is unparalleled both in the classroom, where she teaches middle school at Monomoy Regional, and in professional circles, where she has been a creative, dynamic presenter not only at CAM talks but also at MAFLA and CANE. She is also a tireless organizer at the conventiculum Bostoniense whose light but firm touch behind the scenes makes all the participants’ experiences better.